Holy basil | 5 Most Important Health Benefits & Ways to Use It. As the name suggests, holy basil is not your garden variety basil plant (Ocimum basilicum). Holy basil, also known as tulsi, has a rich history as an important spiritual herb in Ayurvedic medicine that dates back 3,000 years ago. Today, holy basil leaves are as highly regarded as adaptogens, which help the body adapt to mental and physical stress, while also increasing endurance and performance without the crash that you would get with stimulants like coffee. In other words, tulsi tea may be just what you need to get you through your day. But, there is a lot more holy basil can do than fight stress. It is also used for diabetes, acne, adrenal fatigue, anxiety, hypothyroidism, fevers, respiratory disorders, headaches, eye health, dental care, balancing hormones, and even cancer. There really isn’t much holy basil can’t do. Read on to learn more about holy basil, its many health benefits, and also how you can use it for yourself. Holy basil is an important medicinal plant considered sacred by the Hindus in the subcontinent of India. It is mentioned in the Indian collection of Vedic Sanskrit hymns called the Rig Veda around 1500 BC, while holy basil is also mentioned in the ancient Hindu religious texts parts of the Vedas called the Purana. Holy basil is a perennial aromatic shrub that belongs to the Lamiaceae family. The holy basil plant is thought to be native to tropical Asia and north central India; however, it now grows throughout various tropical climates around the globe, and is respected for its many health benefits. In the various traditional Southeast Asian systems of medicine, the different parts of tulsi have been used for medicine, including the flowers, stem, leaves, seeds, root, and even the whole plant. It has a characteristic peppery, light lemon scent, along with purple-pink flowers and oval-shaped leaves with a slightly sharp tip, and somewhat toothed edges. There are two main types of tulsi—the Shyam tulsi with dark pinkish-purple stem and leaves and Rama tulsi with a white stem and green leaves. Both holy basil types smell similar, and possess the same benefits. A quarter cup of fresh tulsi leaves contains 31% of your recommended daily vitamin K, as well as some chlorophyll, zinc, iron, vitamin A, vitamin C, manganese, folate, potassium, magnesium, and calcium. What the health benefits of holy basil? It is highly regarded for its impressive healing powers that promote the systems of the entire body, including the gastric system, cardiovascular system, urinary system, central nervous system, immune system, and reproductive system. Tulsi is naturally designed to help protect tissues and organs against physical stress from prolonged physical exertion, and also chemical stress from heavy metals and industrial pollutants. Holy basil is loaded with the fat-soluble vitamin K, which is crucial for heart health and bone health. Vitamin K benefits blood clotting, bone mineralization and bone density, brain function, and health metabolism and cellular health. Holy basil could also fight bacteria in the mouth, which can lead to bad breath, tartar, plaque, and cavities. This is where adding a drop of tulsi essential oil or drinking a cup of tulsi tea daily may be especially useful. It is also thought to be a natural remedy for migraines or headaches due to sinus pressure. Tulsi also might also help alleviate nearly all respiratory disorders, including bronchitis, asthma, congestion, and the common cold or flu. This is due to compounds in tulsi leaves such as cineole, eugenol, and camphene. Its infection-fighting properties could possibly protect against viruses and bacteria, which also make holy basil great for fevers. The following is further detail on some of the key health benefits of holy basil. Research shows that holy basil could not only fight cancer, but it could also help prevent it. Research published in the journal Nutrition and Cancer in 2013 suggests that phytochemicals in holy basil prevent chemical-induced lung, oral, liver, and skin cancers due to increased antioxidant activity, inducing cancer cell death, altering healthy gene expressions, and preventing blood vessel growth that contributes to cell growth and stopping the spread of cancer from one organ to another. Holy basil may also protect the body from radiation poisoning, while healing damage from radiation cancer treatment. Studies published in the Alternative Medicine Review in 2009 indicate that holy basil protects against toxic chemical-induced injury from increasing the body’s antioxidant levels, including glutathione that helps fight free radical damage due to toxic agents and a lack of oxygen. Holy basil may also have the ability to regulate blood sugar levels and prevent diabetes symptoms, such as excess insulin in the blood, insulin resistance, high cholesterol, weight gain, and hypertension. A study published in the International Journal of Clinical Pharmacology Therapy showed that holy basil could decrease blood glucose, regulate abnormal lipid profiles, and protect the kidneys and liver from metabolic damage due to high glucose levels. A study published in the journal Life Sciences in 2006 found that rabbits had significant changes in fat molecules when they consumed fresh holy basil leaves. As a result, they had higher high-density lipoprotein (HDL) or good cholesterol and reduced low-density lipoprotein (LDL) or bad cholesterol. Other studies found that the eugenol in holy basil could reduce stress-induced cholesterol levels, while reducing total cholesterol in the liver, kidney, or heart after consumption of holy basil leaf powder. High cortisol is a common problem. Cortisol is a stress hormone that has a big impact on memory, learning, bone density, immune function, heart disease, weight gain, sexual health, and sleep. Holy basil, however, is able to regulate cortisol levels and naturally balance hormone levels. A study published in the Nepal Medical College Journal in 2008 found that people that took 500mg of holy basil extract daily felt less stress, anxious, and depressed, while also being more social than before. The researchers concluded that holy basil may be a useful treatment for generalized anxiety disorder. Holy basil kills infections and bacteria, so it might be ideal for acne and other skin problems such as raised scars, keloids, and mouth ulcers. Holy basil is generally safe for the skin, and it heals skin infections both externally and internally. Research shows that it could naturally treat acne when combined with coconut oil as a carrier, which effectively helps the herb absorb into the skin. Do you want to know how to use holy basil? Tulsi plants are grown in nearly every Hindu home. The leaves taste minty, and have a sweet and aromatic smell. Often they are used in soups, sauces, and for garnishing food. They are also used in juices, tulsi tea, and flavored water. People in India also eat tulsi leaves raw for fighting cold or cough symptoms. Tulsi plants can be purchased, or you can get tulsi tea, powder, or leaves from a health food store. For fresh tulsi, look for vibrant and green leaves, without any dark spots or holes. When preparing tulsi leaves, clean them thoroughly, and then chop them coarsely. Use the holy basil leaves within a day or two, or they can be stored in a sealed bad in the refrigerator for around five days. Tulsi tea is a popular beverage in India that is often consumed instead of coffee. Tulsi tea will come in boxes of tea bags, or you can purchase dried tulsi leaves in bulk and use a tea steeper. Simply use two to three teaspoons of tulsi in a cup of boiling water, and steep for five to six minutes. Holy basil extract supplements are also available in capsule or pill form, while the suggested dosages range from 300 to 2,000 milligrams (mg) daily for preventative purposes, or 600 to 1,800 mg in multiple daily doses for treatment purposes. It is best to consult your natural doctor or herbalist for your correct dosage based on your health problem. High-quality, therapeutic grade tulsi essential oil can also be found online or at health food stores. Feel free to add the essential oil to your perfume, lotion, soap, shampoos, or conditioners. Inhaling or diffusing the tulsi essential oil can also provide immune-boosting and calming properties. Check out the tulsi essential oil recipe below for a natural face wash. Combine all ingredients, and blend with a hand blender. Pour into a convenient colored-glass bottle, and store in a cool place. Holy basil is a very impressive medicinal herb that could do everything from fight cancer and protect against diabetes, to fight skin problems and reduce stress and anxiety, and more. Researchers have also found that tulsi and holy basil products are safe for topical use and consumption. That being said, holy basil may slow blood clotting; therefore, taking it with medications that also slow clotting may increase the likelihood of bleeding and bruising. Some drugs that slow blood clotting include clopidogrel, aspirin, enoxaparin, dalteparin, ticlopidine, warfarin, and heparin. Consult your doctor before using holy basil when pregnant, breastfeeding, or trying to conceive. Animal studies have found that the herb may stimulate uterine contractions and affect fertility. It is also best to purchase fresh organic holy basil from a reputable source from an unpolluted and rural environment. 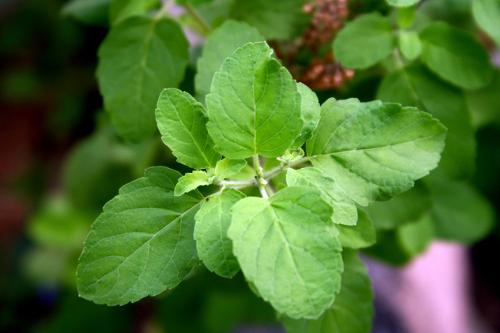 “15 Amazing Benefits of Holy Basil – Tulsi,” Organic Facts; https://www.organicfacts.net/health-benefits/herbs-and-spices/health-benefits-of-holy-basil-tulsi.html, last accessed June 16, 2017. Monaco, E., “6 Holy Basil Benefits (#3 is Going to Change Your Life! ),” Organic Authority, July 16, 2016; http://www.organicauthority.com/6-holy-basil-benefits-3-is-the-most-powerful-of-all/, last accessed June 16, 2017. Bhattacharyya, D., et al., “Controlled programmed trial of Ocimum sanctum leaf on generalized anxiety disorders,” Nepal Medical College Journal, September 2008; 10(3): 176-179. https://www.ncbi.nlm.nih.gov/pubmed/19253862, last accessed June 16, 2017. Geetha, R.K., et al., “Inhibition of lipid peroxidation by botanical extracts of Ocimum sanctum: in vivo and in vitro studies,” Life Sciences, Nov. 14, 2004; 76(1): 21-28. https://www.ncbi.nlm.nih.gov/pubmed/15532130, last accessed June 16, 2017. Agrawal, P., et al., “Randomized placebo-controlled, single blind trial of holy basil leaves in patients with noninsulin-dependent diabetes mellitus,” International Journal of Clinical Pharmacology Therapy, September 1996; 34(9): 406-409. https://www.ncbi.nlm.nih.gov/pubmed/8880292/, last accessed June 16, 2017. Baliga, M.S., et al., “Ocimum sanctum L (Holy Basil of Tulsi and its phytochemicals in the prevention and treatment of cancer,” Nutrition and Cancer, 2013; 65 Suppl 1: 26-35, doi: 10.1080/01635581.2013.785010, last accessed June 16, 2017. Panda, V.S., et al., “Evauation of cardioprotective activity of Ginkgo biloba and Ocimum sanctum in rodents,” Alternative Medicine Review, June 2009; 14(2): 161-171. https://www.ncbi.nlm.nih.gov/pubmed/19594225, last accessed June 16, 2017.